Oriental Lady's Thumb is an annual herb with stems erect, rising up or prostrate at base, 1-2 ft tall, branched from base, hairless, swollen at nodes. Leaf-stalks are short or nearly absent; leaf blade lanceshaped or broadly lanceshaped, 5-13 x 1-2 cm, below appressed bristly along veins, above becoming hairless, base narrowed to rounded, margin fringed with hairs, tip pointed or tapering; ocrea tubular, 7-8 mm, membranous, sparsely velvet-hairy, tip flat, cilia 6-7 mm. Flowers are borne at branch-ends or in leaf-axils, in erect spikes 2-4 cm long, interrupted; bracts funnel-shaped, hairless, margin long fringed with hairs, each 5- or 6-flowered. Flower-stalks equaling bracts, 2-2.5 mm. Flowers pink or red-purple, 5-parted; tepals elliptic, 1.5-2 mm. Stamens 6-8, included. Styles 3, fused to below middle; stigmas capitate. Achenes included in persistent perianth, black, shiny, broadly ovoid, trigonous, about 2 mm. 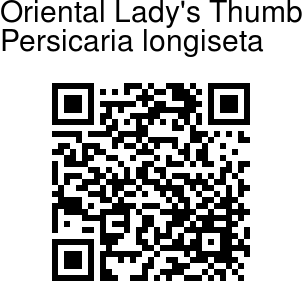 Oriental Lady's Thumb is found in China, India, Russia, Japan, Malaysia. It is found in Kashmir, Nepal and Eastern Himalaya, up to 3000 m altitude. 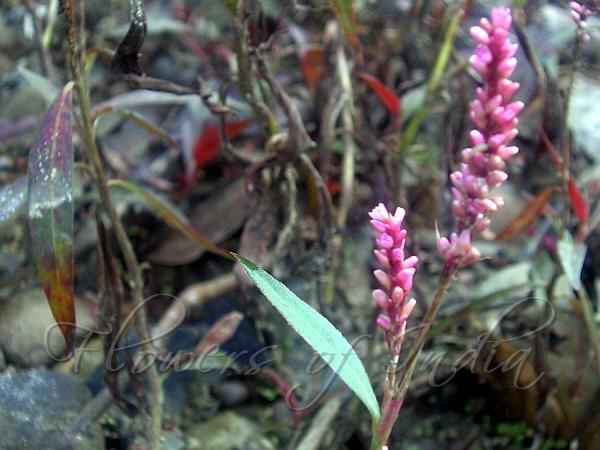 Photographed in Itanagar, Arunachal Pradesh.